Those that can, do. 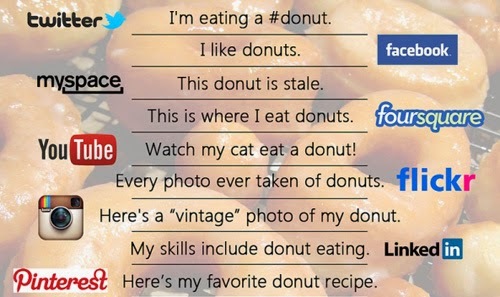 Those that can't, I suppose... tweet, pin, like, listen, or watch others do stuff... apparently with donuts. Before you get your knickers in a twist, or try 'hashtagging' me with irate messages, know where I'm coming from, with a few additional interrogatives thrown in to explain the whys and wherefores of my cynicism. And How and Why and Who." ~Rudyard Kipling, from "The Elephant's Child"
WHO: Inquiring minds want to know. WHAT: How to use Social Media. WHERE: At a University, which shall remain nameless, in Philadelphia, PA. WHEN: Saturday, May 17, 2014, 10 AM - 4 PM. WHY: to promote a book, skill, brand, company, increase sales, or attract viewers to websites and blogs... all reasons given by people for attending the workshop, with the exception of one woman, who never said why she was there except to say that she has two sons, one who works for Apple and the other Google. Her purpose? Bragging rights I suppose. Me? "Excuse me... my cell phone's ringing"... that would be my 'not-so-smart' Motorola RAZR V3 black flip-phone with text messaging disabled. I was there to leap into the 21st century. So now you know my phone is just a phone... not a map, book, itunes' player, album or camera, at least one you'd want to use, but it functions perfectly, is cost efficient, compact, aesthetic, and not something I'm willing to trade in just yet, for the sake of owning something new. And while I'm also not ready to devote endless hours friending those on Facebook, tweeting opinions on Twitter, pinning my favs on Pinterest, or uploading every life's moment on Flickr, YouTube, or Vimeo, though I might in the future, I still want and need to be enlightened on how today's technology works. HOW: to actually use Social Media, unfortunately, was never discussed. Instead, this five-hour 'Power Pointy' presentation was only about 'why' Social Media is used, something I already understood from reading Jonah Berger's book, Contagious: Why Things Catch On. It's based on one of Jonah Berger's six "STEPPS" (an acronym). 'P' for Public (visibility)... When we see others doing something, we're more likely to imitate it. "If it's built to show, it's built to grow." 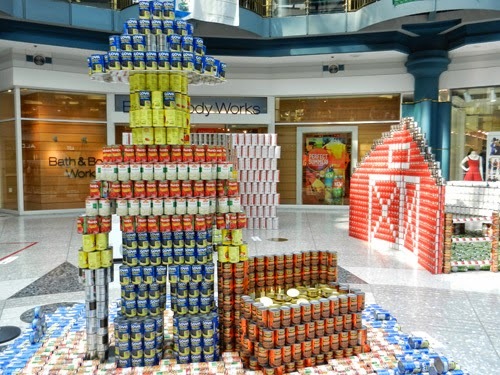 WHAT: "CANstruction Philadelphia 2014", a sculpture exhibition. WHERE: The Rotunda @ The Shops at Liberty Place, 16th and Chestnut. WHEN: May 10- May 18, 2014.
WHO: Sponsored by AIA (American Institute of Architects) with sculptures built by local architects and engineers. Structures cannot exceed 8'L X 8'W X 8'H and must be structurally self-supporting. Materials permissible but preferred not to be seen: 1/4" cardboard, masonite, plywood, plexiglass, used for the purpose of leveling or balancing materials but not as load bearing. No props, or permanent adhesives. Also allowed: clear and double stick tape, Velcro, nylon tie-backs, nylon string, wire and high tension rubber bands. All cans must be full, unopened with labels intact and legible. Labels may not be covered, stripped off or altered in any way. Junk food and expired food items are not permitted. 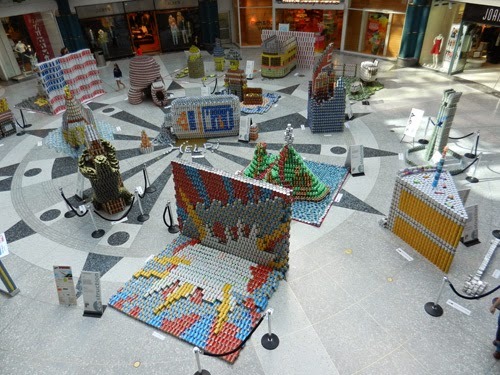 Boxes and bags are discouraged, as the name of the competition is CANstruction. Teams: Only 5 team members can build their structure at one time. Members can be swapped out and are allowed a maximum of 15 minutes for the transition. One extra member may be used to un-box cans. 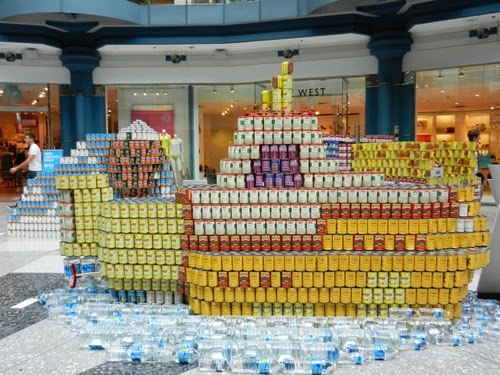 Teams are responsible for obtaining their own supply of canned food, provide an inventory of all cans, name each food product, the quantity of each food product, the total # of cans used, and the cost of food items purchased or donated. Phew! With all those restrictions, it's amazing anything got built, let alone creatively! "From Skull Island to Manhattan, King Kong decided to look for the most magnificent skyscraper to climb. He found himself in Philadelphia to find just what he was looking for - the iconic Bell Atlantic Tower. We opened up our imaginations as well as our cupboards to show you his journey to his next conquest. In "KING CAN," stacks of crab meat and "Can"nelli white kidney beans create the building's bold form, with the stripes of their labels suggesting the vertical nature of the building's distinctive columns of windows. The can colors represent the bold brick tone of the structure whose building design is representative of the historic use of brick in the city of Philadelphia, distinguishing the building amongst all others on the city skyline. The giant gorilla is made of small cans of black olives, which are able to express his organic shape as he "Can"tilevers from the rigid form of the building. He still looks pretty ferocious climbing up the structure, but hopefully being stuffed with olives will cut down his appetite for airplanes... or maybe not!" 1st Runner Up and People's Choice award: POP! It's BONK!ers that there are almost a million people in the Delaware Valley who face hunger every day. This fact makes our heads go KA-BOOM! 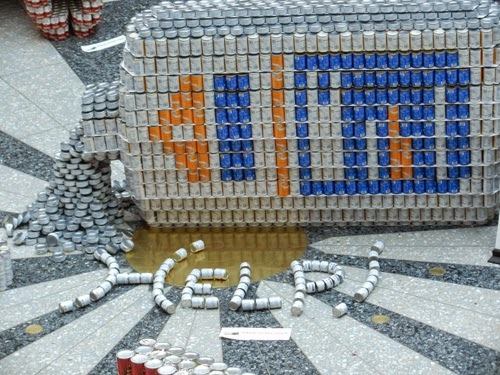 We are CANstructing in support of Philabundance's POW!erful mission to ZAP! hunger. When Roy Lichtenstein's 1996 "POP!" cover of Newsweek Magazine SNAP!ped into our minds, we knew it would put the perfect exclamation onto our point!" 2nd Runner Up: EWE CAN End Hunger! "When asked about our design, forgive us if we sound a little... sheepish. It's not that we expect to be lamb-basted for our work; we're actually quite proud of what we've accomplished through shear determination (and a wee bit of flock)! While we could have been vegging like couch potatoes, instead we designed something fun, some may say "corny", to help out a great organization, Philabundance. It's been challenging, but we think ewe'll agree it was wool worth it!" Congrats to the following teams who also won awards and to all those who participated. 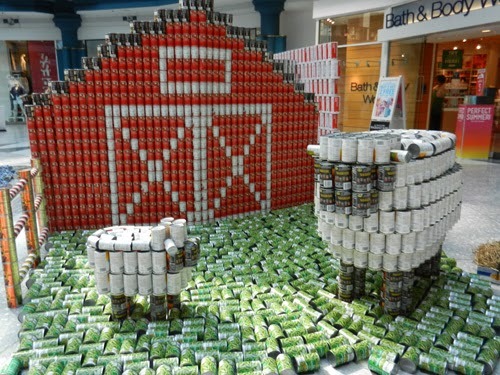 Among the 16 participating teams in this year's 'CANstruction Philadelphia', over 57,000 cans of food were donated to Philabundance. Marshall McLuhan once said, "The medium is the message" and the message here is... "CANstruct a World Without Hunger: One CAN make a Difference." McLuhan also said, "If it works, it's obsolete," which means by the time I get around to figuring out all this Social Media stuff, something new and hot will have taken its place. Time for a donut and a hot coffee. 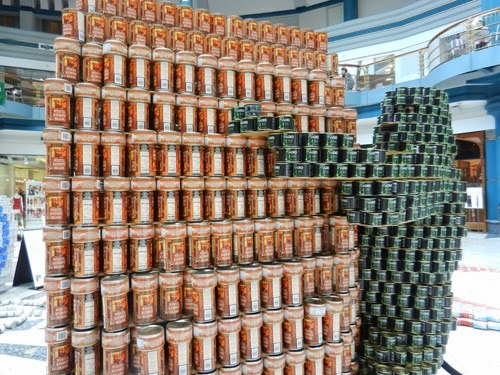 Do you have a favorite canned food item? If so, what would be your preferred method for communicating about it? Rudyard Kipling's, "The Elephant Child" with the entire poem located at the bottom of the short story here. A not so flashy, but informative video on: "Why Things Catch On" with Jonah Berger here. Blendtec videos: "Will It Blend" glow sticks? here, "Will It Blend" an iphone? here. 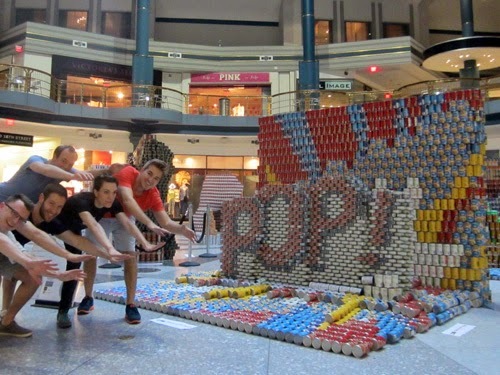 Watch "LUV CAN" a CANstruction being built by GBBN Architects in Ohio here. Marshall McLuhan: Communication Theorist here. Doughnut: The Official Story here and one dozen donut facts here. Celebrated every year on the first Friday in June. Free Donuts! Check your local donut shop for details. I believe we've become a nation of "over-sharers". I just don't get why people think that their every thought or what they had for lunch that day or that they got their nails done today are of much interest to anyone but themselves or a very few people. I don't understand why Twitter is so popular. Don't people have better things to do with their time than to be constantly posting and reading other people's posts? I guess I'm getting to be an old "fuddy duddy". While sitting in the airport awating my flight a week ago I observed people, as is always fun to do. I noticed that I seemed to be practically the only on not connected to some electronic device. People were either plugged into their music with little buds in their ears or were looking at their phone or ipad. I was feeling like a bit of a dinosaur actually reading a real book. Actually, it was my trusty friend, the "Reader's Digest" which I always have with me if there will be any reason that I will be in a situation where there is nothing but idle time. 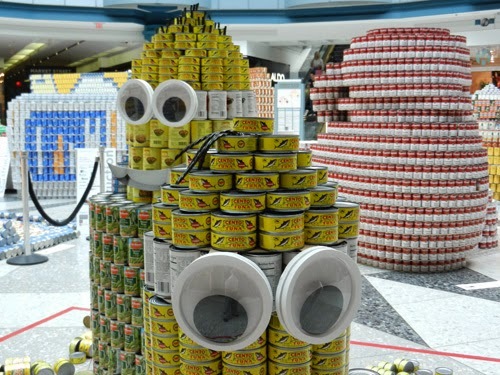 The can sculptures were so creative and fun! I love that they are being donated to a good cause. I enjoyed the clever use of the "can words" in the groups' statements about their creation. I never thought about my favorite canned food until you posed the question and I still don't have an answer to that question. I will ponder that and maybe have an answer at a later date. But one of my favorite foods are donuts! That is one item that I will not pass up if offered. 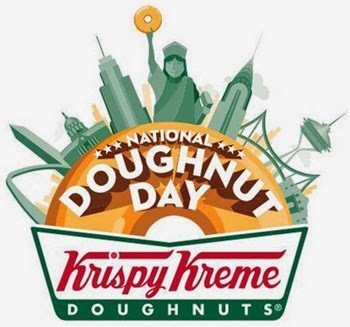 I didn't know that the first Friday in June is free donut day...I will have to mark my calendar for next year. When I was a kid I found a book in our classroom library that I loved. It was about a boy who invents a donut machine. I wished there was such a thing. In the story things go wrong and his machine starts turning out more donuts than he knows what to do with like in The Sorcerer's Apprentice. They are piled up everywhere. I don't remember the solution to resolve his problem though. Funny, I hadn't thought about that book in years but your blog brought it to mind. Will it blend? Yikes! Those videos mad me wince. A nation of "over-sharers"... guess we have E.D. 's (electronic devices) with instant communication to thank or curse for that. I'm guilty of over-sharing too with this blog. Before E.D. 's, only well known authors got their thoughts printed and read. Now it's everybody's game. Someone coined the term "head down" zombies to describe what you observed while waiting for a plane at the airport. It's a lot like watching a Sci-Fi movie, with everyone zoned out, in their own little world, head down and plugged into some sort of device. DId some one say donuts? Yum! I had no idea you had a weakness for them. I would have pegged you for a smoothie or apple pie gal. What an eye for the unCanny perspective only thou canst conceive and deliver to we, the fortunate viewers of your blog. You maybe or can be, can-on-eyesed as a patron saint, (albeit a Jewish one), of pop arts, playfulness.....now as for a favorite food in a can, I can't in all candidness canfess to a favorite.... I can only think of my worst. Canned peas!!!! They could cancel hunger pangs, even if eaten under the glow of a candelabra. Incandecent, to say the least! What playfulness in your written words! I'm going to have to start calling you 'Jo e.e. D' in honor of e.e. cummings, who too would have chuckled at your comments.